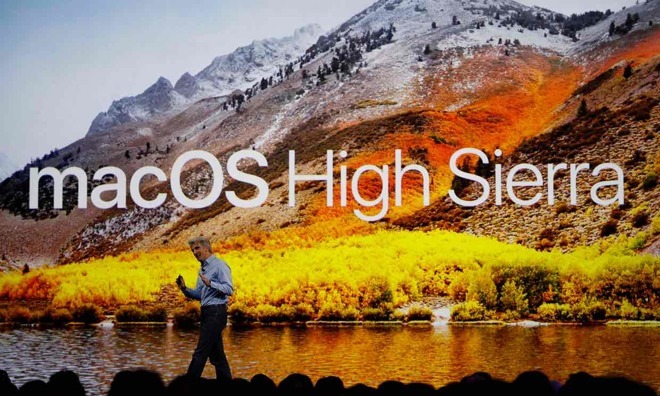 Presented at the 2017 WWDC conference, Apple's Senior Vice President of Software Engineering Craig Federighi announced the new version, and highlighted a few features of the macOS operating system update, due in the fall. Other additions to Safari include blocking of auto-play videos, Intelligent Tracking Prevention using machine learning to identify trackers and segregate cross-site traffic monitors. Mail includes a new composition screen, and 35 percent less space to store mail boxes. Photos has a new view, including a chronological display, and new filtration mechanisms. Metadata including categorization are automatically synchronized across devices. New editing tools have been added, including selective color modification, curve changes, and all edits synchronized from Photoshop or Pixelmator back to the photo library. Apple has also opened up its printed photos to third parties —but hasn't shared much information on it. The new default file system will be the new APFS, coming to High Sierra. An Apple demonstration of a copy was nearly instantaneous. APFS was designed with all of Apple's platforms in mind, scaling from watchOS to iOS and tvOS to macOS, and taking advantage of the fact that most of the company's products are now using Flash or SSD storage. It also was designed with encryption in mind as a primary feature. Apple's iOS 10.3 brought APFS seamlessly to the iPhone and iPad. Citing the wider adoption of 4K and HDR videography, Apple is adding support to macOS for H.265 and HEVC. The MacBook, MacBook Pro, and new hardware announced today will all have hardware decoding support for H.265, but all High Sierra compatible machines will support the codec. Metal 2 includes driver optimizations, and apple claims that it brings up to a 10 times better draw call throughput. More bugging tools are now available, and the Mac Window Server has been migrated to Metal as well. Federighi noted that Apple uses Metal for deep learning, and this will continue even further in High Sierra. Perhaps most importantly, Metal 2 will ultimately bring the ability to use Thunderbolt 3 external enclosures for high performance video cards officially in macOS. A developer kit will be made available with an AMD GPU, with the capability ultimately being brought to all users. Federighi also announced that Metal will be coming to augmented reality solutions. Apple is working with Steam, Epic with the Unreal Agency, and Unity to bring their VR platforms to macOS. High Sierra will be available today for developers, and later in the month for public developers. Any computer that supports Sierra will run High Sierra.